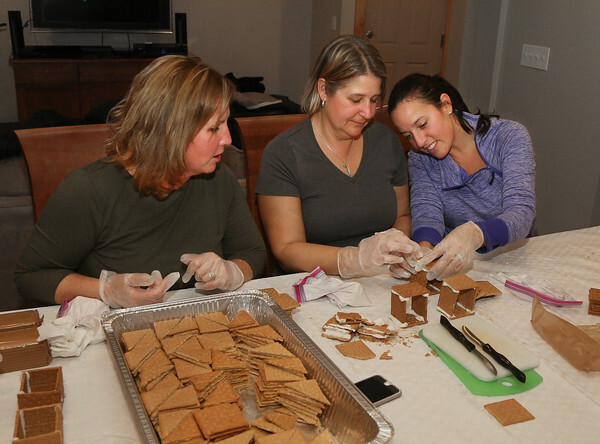 From left, Kelly Mahony, Julie Broe and Amy Racofsky, all mothers of Beeman Elementary School students, work together Tuesday evening to build gingerbread houses in preparation for Saturday's annual Beeman PTO Holiday Fair fundraiser. The three were part of a group of PTO members who gathered at the home of Melissa Francis to build 175 gingerbread houses which will be sold in kits along with frosting and candy that children can use to decorate the houses themselves. Saturday's Holiday Fair will include Christmas tree sales, food and craft vendors and activities for children. The event will be held from 9 a.m. to 2 p.m. Saturday and the public is invited.